The first two books of the Dark Materials trilogy are great novels. 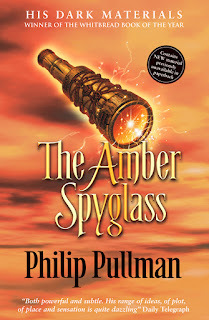 But really they simply are setting the scene for the brilliant climax that is The Amber Spyglass. In this final book, Pullman ties together all the many plot strands into one great ending; teaches the reader a great deal about Milton's Paradise Lost (even if they don't really want to learn it), confuses the hell out of anyone who thinks they know about good and evil and lets the reader explore every possible emotion. The scope of Pullman's novel is nothing less than the final battle for heaven; though Pullman is candid enough to ensure that heaven in this context isn't what everyone thinks it is. That he does this in a book aimed at young adults, without patronising them is brilliant. That he simultaneously is able to describe the sheer embarrassing, awfulness of puberty, the agonising pain of first love and the appalling reality of betrayal is genius. The characters are wonderful to. Let's hear it for Mary Malone, the former nun turned particle physicist. How's that for a progressive role model? 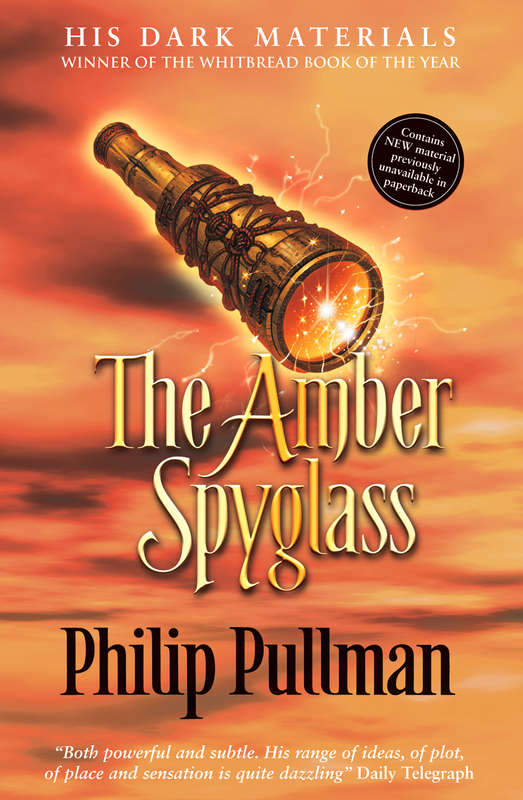 Our two, flawed heroes are joined by almost all the characters from the first two books as nearly everyone in Pullman's universe takes sides as they prepare for the final conflict. At the same time, Will and Lyra are growing closer and learning precisely how important they both are to the war's outcome. We meet some new characters and are rejoined by some old ones, which helps to give this book, a much longer one that the first two, the feeling of an epic tale. But most readers I suspect will remember not the great set pieces but the intimate moments between the two main characters. The scene where Will and Lyra share a tent and each pretends to sleep as they think about each other and share their company is a beautifully, tender moment of literature. The book has many more. The ending hits the reader like a hammer. Its impact was in no way lessened by the fact I'd read it before. In fact, it's probably even more emotional the second or third time. Rightly the trilogy has been lauded a great deal. Anticipation is high for the sequels. But read, or re-read these books before the follow ups arrive. They're books with great depth that have much to say about the eternal themes of war, love and betrayal. I discovered your blog thanks to your Albert Speer/Gitta Sereny post & I see we have quite a few books in common as well as our love of history. I'm hoping to reread this trilogy before the new book comes out, but I work in an Indy bookshop and having time to reread old favourites is difficult when so many new releases tempt me each month!